Eldee-2 Velocette racing on the Isle of Man! 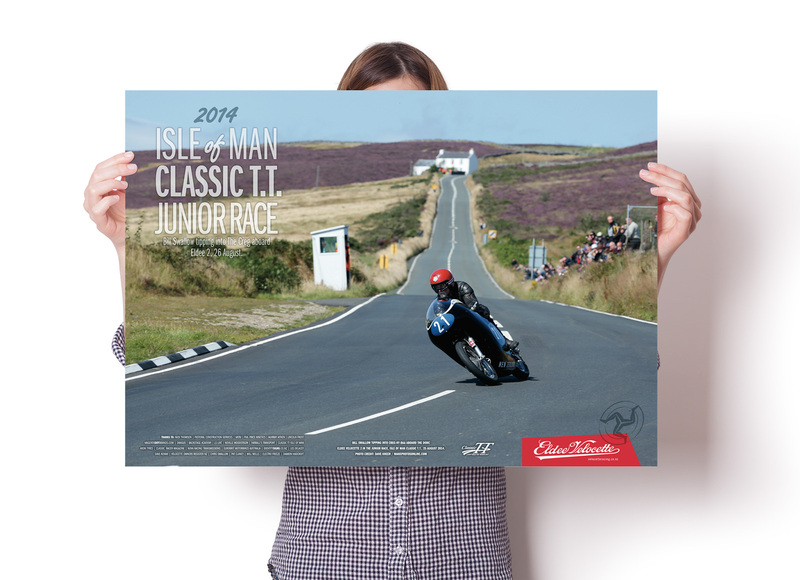 A set of four posters, hand-signed by the rider Bill Swallow, designed to commemorate the VRNZ, Isle of Man Classic TT 2014 campaign. The action photos feature Bill Swallow whistling round the mountain course aboard Eldee-2. Flying over Ballaugh bridge, rounding the bungalow, and tipping into the Creg. I searched out the most spectacular shots of Bill Swallow racing the handbuilt Eldee-2 250 Special Velocette in the Isle of Man Classic T.T. Junior race, August 26, 2014. The posters were designed to be gifted to the project sponsors and supporters-in-kind as a premium acknowledgement of support and thanks. To finish the presentation and add value to the posters Bill Swallow signed a numbered edition of 25 of each of the four kinds.